The Juan Valdez above Earth, [3ACV05] in 3001. The Juan Valdez was a super tanker full of rich Colombian dark matter. [3ACV05] It was incredibly robust, made up of 6000 hulls to prevent leakage. 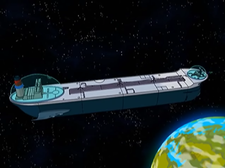 Professor Farnsworth sent the Planet Express crew on a mission towing the ship within three feet of a penguin preserve on Pluto (to avoid a toll booth), which Leela refused to take part in due to the high environmental risk. The ship was instead piloted by Bender, who began flying recklessly and upside-down while he was intoxicated by the lack of alcohol intake. Nearing the surface of Pluto, the tanker's hulls were all penetrated by an iceberg, causing the entire ship to leak onto the penguin habitat. The tanker's fate is unknown, but it is probably destroyed. Juan Valdez is the name of a mascot for the National Federation of Coffee Growers of Colombia. ^ See also Petroleum oil. This page was last edited on 26 May 2017, at 14:06.